Cyprus Hidden History – Did the Greeks offer to partition Cyprus? Did the Greeks offer to partition Cyprus? kish aim after 1957/8 was Partition. The Turkish side does not dispute this, but point out that had the GCs not campaigned for Enosis then destroyed the 1960 constitution the question of division would never have arisen. The GC’s on the other hand point out that the 1960 constitution was unjust and needed to be overhauled. They point out pressure from the UK and Turkey in what they perceived to have been a forced marriage. All these arguments would have meant little if both sides decided to make the best of what was feasible rather than the dreams of joining “motherland’s Greece or Turkey” respectively. So while the never ending saga goes on and on, it seems both GC’s & TC’s instead of taking some responsibility for the fiasco of the last 60 years, they much prefer to blame everyone but themselves. 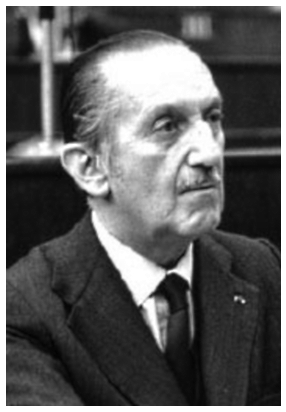 In fact the history of plebiscites in support of Enosis was not even new to the Cypriots, neither did it start with the 1950 Enosis Plebiscite in which the Greeks voted by 95.71% for Enosis, it eventually culminated in the Coup and subsequent Turkish intervention in 1974 which has effectively partitioned the Island since with no end in sight to a re-unification of the Island. The first plebiscite was carried out 25 March 1921 on the 100th anniversary of the Greek independence struggle against Ottoman occupation. Another took place on 25 March 1930 (one page copy with the signatures of the leaders of the GC community in the village of Lurucina is attached to this article). The biggest hypocrisy of Cypriot political thinking is that everyone is to blame for the division but the Cypriots. So who voted in these plebiscites? It certainly was not the Americans, British or any aliens, but the GCs themselves, which if successful would have meant that Cyprus would never become an independent country. What about Greece & Turkey however. A reasonable guess would be that both rue the day they got themselves in a dispute that has almost dominated every part of political and diplomatic activity since the mid 1950’s. Much talk has been made of the GC desire for Enosis, but what of Greece itself. Did they originally welcome the GC armed uprising? Were they really happy to push for a Union that may, and did result in catastrophic consequences in 1974? As for Turkey much talk has arisen from the efforts of the TCs to bring them into the equation as a balance to TC survival in Cyprus. Anyone denying that is obviously pulling the wool over their own eyes. It’s a well known fact that the GC’s pushed for Enosis and the Turkish countered with Partition. Each side had limited power so dragging in their respective “motherlands” was essential to achieve either goal. upport such a move or risk being branded as Bro-odez (traitors). Turkey on the other hand felt that the status quo with the continuation of British rule was preferable to that of Enosis. Both Turkey and Greece had signed a friendship pact in the 1930’s and in the aftermath of WW2 Turkey was quite happy to allow sovereignty of the Dodecanese Islands in the Aegean sea to be passed from Italy (which had occupied these Islands since the end of WW1) to Greece on the sole condition that they remain demilitarized so as not to ever threaten Turkey. 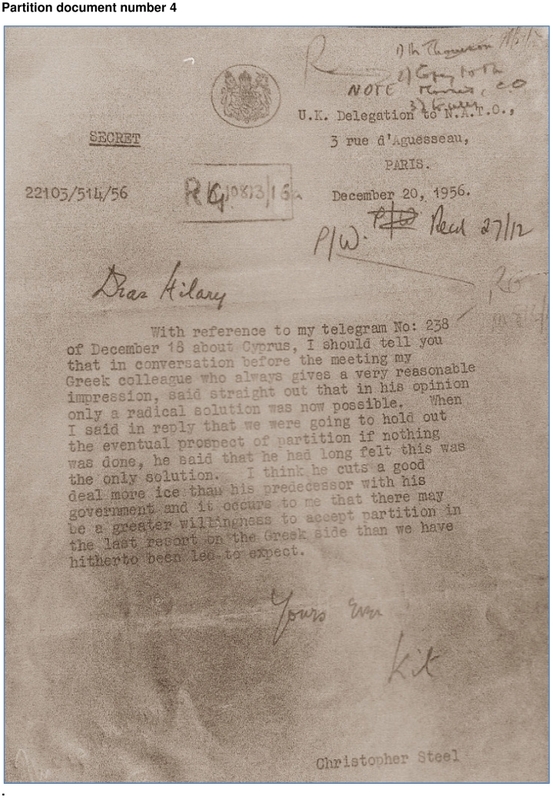 Subsequently both Greece and Turkey signed the NATO treaty in London on 22 October 1951. They both officially became members on the 18 February 1952. In addition they both fought together in Korea. Greece was the fifth largest troop contributor to U.N. Forces in Korea losing 183 men and 600 wounded. Turkey’s contribution was even larger and their losses of 721 dead, 168 missing and 2111 wounded was immense. The sacrifices of these 2 countries fighting together meant that their relationship until the start of the Enosis campaign on 1st April 1955 was cordial. In addition Greece had suffered immensely under Nazi occupation in WW2 and the subsequent civil war between 1945-49 cost the Greek people over 150.000 lives. Surely the last thing Greece and Turkey wanted at the time was a potential conflict. Greece and Turkey were trying hard to extricate themselves from the potential disaster ahead of them. Did they make mistakes?? YES THEY DID. In fact the biggest accusation of the GCs (while excusing Enosis) against Turkey was that it planned to partition the Island. Did they? An official British letter dated 22nd October 1956 completely contradicts this well rehearsed propaganda. 2. 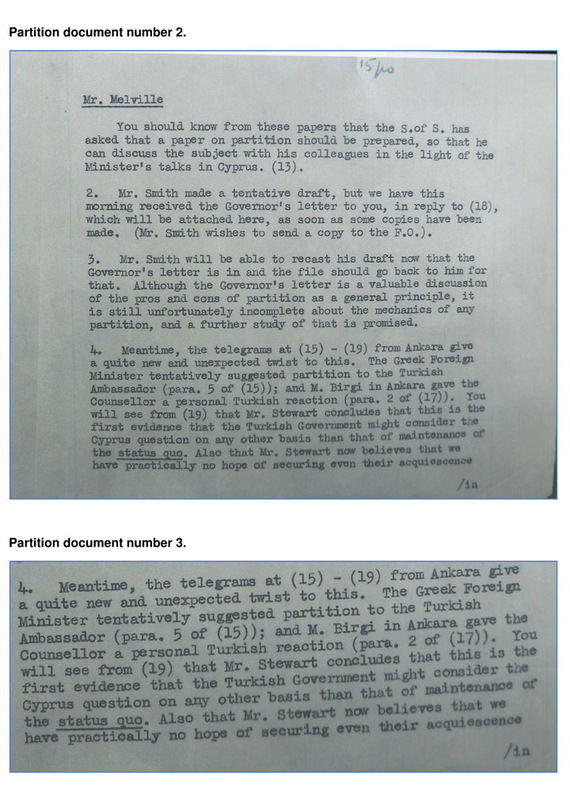 Meanwhile (i) the Governor has given further views about partition in his reply to you (scribble) at (21), and (ii) there has been the series of telegrams at (15)-(20) from Ankara, with the interesting and unexpected information that the Greek Foreign Minister threw out a suggestion about partition to the Turkish Ambassador-para. 5 of (15). In another letter the Greek proposal is again repeated and in addition has the following. 4. Meantime, the telegrams at (15) – (19) from Ankara give a quite new and unexpected twist to this . The Greek Foreign Minister tentatively suggested partition to the Turkish Ambassador (para. 5 of (15) ; and M. Birgi in Ankara gave the Counsellor a personal Turkish reaction (para. 2 of (17). You will see from ( 19 ) that Mr. Stewart concludes that this is the first evidence that the Turkish Government might consider the Cyprus question on any other basis than that of maintenance of the status quo. Also that Mr. Stewart now believes that we have practically no hope of securing their acquiescence. The real important sentence is the following. “first evidence that the Turkish Government might consider the Cyprus question on any other basis than that of maintenance of the status quo”. It’s clear that up to the 22nd October 1956 Turkey’s policy was the continuation of British rule and that Greece’s offer to Turkey completely changed the destiny of Cyprus. So why did Greece keep a public silence and let Turkey and Great Britain carry the proposal into the public domain? The implications were clear. Greece could not possibly make such an offer public. The Greek people and GC reaction would have been such that no Greek government could survive such a proposal. 7 years after the end of the Greek civil war the potential to re-ignite the internal conflict was immense and a coup by the Greek army could not be discounted. designed to completely revise history. The Turkish side on the other hand has completely failed to understand the importance of International PR and prefers the policy of “who cares, we know the truth and so does the World”. The fact is the world did not know the facts behind the scenes and after 60 years care even less. In short the Turkish side has failed abysmally in the media war, while the Greek side has taken full advantage of every possible avenue to shift blame away from itself. The Embargoes on the TCs, the use of their position as sole representatives of Cyprus on the international stage have all played a part in cementing the partition they profess to hate. So while today both Greek and Turkish Cypriots blame everything on Turkey and Greece, which no doubt played their own part in the Cyprus tragedy. it would be well to remember that the GC rejections of 14/15 plans out of 16 have played an even bigger part in the continuation of the status quo, while TC mistrust of Greek intentions still dictate political and historical mistrust of “Greek deviousness” to the point that every proposal regardless of whether its good or bad must somehow have an ulterior motive. After everything is said and done however one thing we Cypriots (Greek & Turkish) have in abundance is that we are head and shoulders above every country in the quality of our obstinacy, self pity and above all denial of our part in the destruction of our Island. 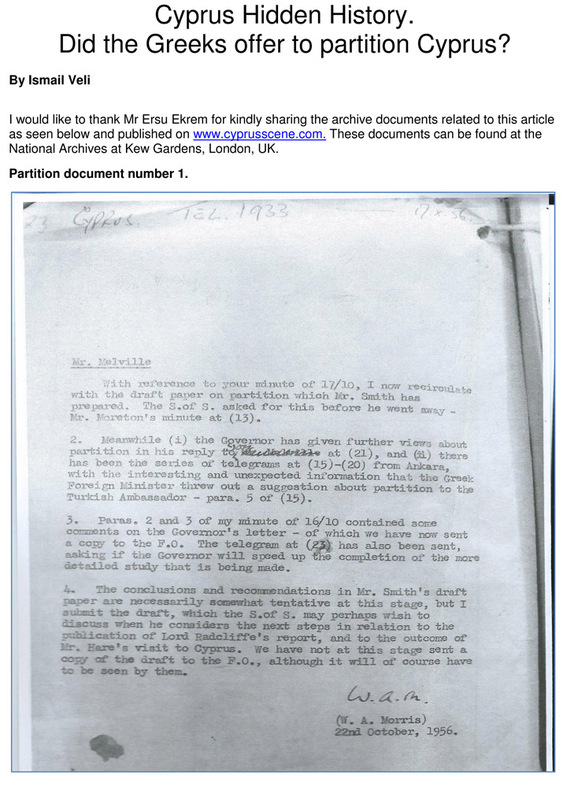 I would like to thank Mr Ersu Ekrem for kindly sharing the archive documents related to this article as seen below. These can be found at the National Archives at Kew Gardens, London and we also include a PDF copy which can be seen by clicking here. Ismail Veli telling it how it is, very raw without any base description of problem riddled Cyprus history. Your argument is based on official correspondence. surely the Greek Cypriots could be thinking and planning one thing while communicating the opposite? Thank you for sharing Nigel on North Cyprus Forum with your many members. I congratulate Ismail for a well balanced and informative article . The article is lifting the vale placed on the truth to reveal it at last. It is bound to bring down the stack of propaganda cards based on the “made up history” . Once again well done Ismail. Thank you Ersu. As you know I always try to look at the wider picture and try to analyse the prevailing situation at any given period in history. Sadly many writers and “so called historians” add todays ideological thoughts and way of thinking into the past and it corrupts the facts. Last but not least I would again like to thank you for your remarkable research abilities which have made this article possible. Your understanding and treatment of historical happenings is very appropriate, dear Ismail, also very timely and very helpful. Keep up the good work. I will add a small note from an outsiders POV, and it’s regarding the propaganda war as covered in Ismail’s article, my parents and many of their contemporaries did, and in many cases still do, believe that from that day in 74 Turkey was and is the only aggressor in the matter of Cyprus. I’m happy to say that since my marriage into a TC family I have been able to educate my parents and myself on this issue, and in light of all the new evidence emerging it will only be a matter of time until the record is set straight. Thank you Nigel for your comment, we are all working hard to promote the TRUTH of the Cyprus issue as then, if all parties accept the wrongs of the past, there is real hope of the two communities living in harmony either together or side by side. Thank you Nigel. Sadly as you point out the history of Cyprus is normally one sided, and yet our experience’s gives us a different story. If the problem had only started in 1974 then us TCs must have just been dreaming the previous 20 years. its ludicrous off course, therefore Its up to us to uncover the hidden history of our tragic past. Sadly the TCs have failed to understand this basic principle. Your experience is proof that there is always 2 sides to every story. Thanks for the history lesson Ismail, how did Mr Ersu Ekrem get an access to the archive documents related to this article, are they in public display now? 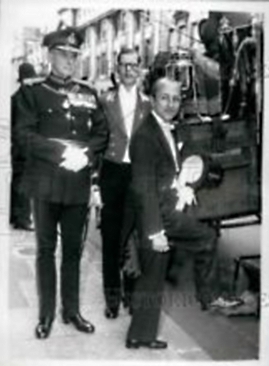 And you are right about the both G&T Cypriots being stubbon. However, keeping the situation unsolved was more beneficial for Greeks than Turks as they immensly benefited from all the international financial aids offered to Cypriots since 1963, don’t you think? Tulen Thank you for your comments. Ersu and I often research together. Ersu in particular has a keen eye for finding documents buried under the dust. The documents are indeed at the national archives. With thousands of documents to look for, a lot of patience is needed. Sadly many of our TC historians are too lazy or politically motivated, therefore the level of research they do is not as it should be, hence our predicament. There are off course exceptions. But its incumbent on us to go and find the true history as the Greeks have managed to bury it under tons of propaganda. The sad thing is that the vast majority simply do not, or will not except their role in the Tragedy of the Island. As for whether the Greek side has benefited from being the sole representative of the Island the answer is yes, BUT and its a big BUT this benefit is purely cosmetic as they helped divide the Island and played a part in destroying the Republic they claim to represent. The inability to admit their mistakes have cost them dearly. Easier for them to blame everyone but themselves. Hello, fascinating stuff. Are you able to provide the reference code for the Archive in Kew for these documents so I may conduct further research? Great article! Thanks to the authors/researchers for this exemplary piece of outstanding investigative work. Much better contribution to the ongoing discussion about the issue than most politicians or so-called historians’. Hopefully the lies of the Greeks and the Greek Cypriots will be known to the whole world soon. This is so interesting. I have always been embarrassed by the role my own country (UK) played in the story of Cyprus, but as always there is more to know! Do hope you can get this information out to the wider world. It should be taught in TC schools too. Until both sides speak each other’s languages, figuratively and actually, I see no possibility of reuniting culturally and politically. Thank you for this very educational article. Thank you for your comments Jan. There is a lot that needs to be uncovered. The Cyprus problem is not as clear cut as many would have us believe.